Welcome to the return of Arguing With Idiots. For past editions, click here. I have heard nothing but verbal diarrhea over the last few days. The Knicks and Nets each land one of the biggest names in the league, yet no one seems to be happy. Instead of being happy about landing Carmelo, Knick fans have been irritated at losing players such as Timofey Mozgov. Instead of being thrilled about landing Deron Williams, I have yet to hear one Net fan say anything positive about the trade. Well, I haven’t talked to many Net fans since they barely exist, but that’s beyond the point. Calm down, no need to yell. Melo would have likely went to the Nets if he didn’t get traded to the Knicks. He would have risked losing a lot of money by not signing an extension before the new CBA. Also, there is no guarantee the Knicks would have been able to sign him in July. A franchise tag in the new CBA could have stopped it. Even if the Knicks would have signed him in the offseason, Melo would have likely demanded a sign-and-trade, making the Knicks give up a draft pick or two anyway. You wouldn’t have known who Mozgov was if D’Antoni didn’t put him in the rotation in the last few weeks. The Knicks have actually played better without him. There won’t be a problem replacing his 4 PPG and 2 RPG. Gallo and Chandler are huge losses. That they are. But sometimes you have to give something up to get something. In this case, the reward was too big to turn down. Gallinari plays the same position as Melo, so he would have just been a 6th man. Chandler was a valuable piece, but he was an RFA at the end of the season. Holding on to him could have complicated the Knicks’ cap situation in the upcoming years. Billups is a downgrade from Raymond Felton. Maybe, but Felton was never the long-term plan at the point. Billups is a a solid veteran who can shoot the ball and mentor other players. He may be able to turn Toney Douglas into a great point guard. I still think Chauncey is the best player in the trade behind Carmelo. Deron Williams isn’t as good as Chris Paul. Arguable, but who cares? Deron is still an elite point guard who is definitely top-five in the league. Williams, being a superstar, can also attract big names like Dwight Howard to New Jersey/Brooklyn in future seasons. Why would you give up Favors? Favors could have taken years to figure out. Developing him into the next star PF would have taken a lot of time with no guarentee for success. The Nets can find a franchise power forward soon, I am confident of it. Two first rounders is too much. It could be, but would either of those picks turn out to be as good as Deron? The Nets clearly got the best player in this deal. This is a superstar’s league. If you don’t have at least one, you aren’t going anywhere. The Nets needed one, and they got one. There’s no guarantee he will re-sign in 2012 when his deal is up. He is eligible to re-sign in July of this year, and I think he will. It would be smart of him to get a contract extension before the new CBA. What other places will have the cap flexibility and marketing opportunities that the Brooklyn Nets will have in 2012? He could go to the Knicks, but I think they will set their sights on CP3. In the end, both the Melo and Williams deals were great for the Knicks and Nets. The Melo deal finally brought true Knicks basketball back to New York City. The Deron deal helped the Nets acquire the star they’ve been longing for since their glory days. 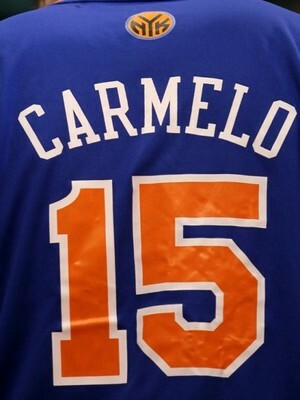 Melo makes his Knicks debut tonight. Jared Zwerling of ESPN New York provides a timeline of the Nets-Knicks rivalry since Mikhail Prokhorov took control of the Nets. Since taking control of the team, Prokhorov has talked big and has tried to get the Nets on an equal playing field with the Knicks in the New York market, but to no avail. The Knicks have been a playoff caliber team this year, while the Nets have struggled greatly. And now that the Nets have lost out to the Knicks in the Carmelo Anthony sweepstakes, the Nets have seemingly lost the battle. This town has always been a Knicks now, and it still is for the time being. According to the Denver Post, Carmelo Anthony is about to become a Knick. This is a huge moment not only in Knicks history, but in the history of the NBA as well. This trade would almost guarantee a new big three in New York, setting the Knicks up as perennial contenders. By adding Chris Paul or Deron Williams in 2012, this team can become championship contenders. For now, they will be pretty damn good. Who knows, this team right now may be able to win a playoff series or two. For now, Knick fans can sit back and enjoy their new superstar. Congratulations to the Knicks franchise and their dedicated fanbase. Update: Frank Isola has just confirmed the deal. Wilson Chandler, Raymond Felton, Danilo Gallinari, Timofey Mozgov, the Knicks 2014 first-round draft pick, the Warriors’ 2012 second-round pick, the Warriors’ 2013 second-round pick and $3 million in cash. Anthony Randolph and Eddy Curry. We’re three days away from the trading deadline, and Carmelo Anthony is still a Nugget. With Denver in action Tuesday night, we could see a deal get done today. -The New York Post is reporting that Carmelo Anthony will inform the Nets today whether or not he will accept an extension with the Nets. The Nets and Nuggets are said to have a trade in place, the only roadblock is Melo’s willingness to sign an extension with New Jersey. – Carmelo met with Mikhail Prokhorov Saturday night. Prokhorov called it a “fantastic” meeting, and even went on to call it a good tactical decision to force the Knicks to give up more for Melo. – Deron Williams has denied the rumors of him wanting to play in New York. – According to Real GM, David Stern didn’t want an announcement Sunday. – The Knicks seem to not want to go any further with talks. They have made their final offer. However, the Nuggets want Timofey Mozgov included in the deal. – Chris Broussard reports that the Nets would be interested in a separate trade with Denver for some Knicks players they would acquire in the Melo deal. – Some sources are saying the Nets have thrown in the towel, while others are saying the exact opposite. It’s hard to tell what to believe right now. As new stories develop on Melo or the trading deadline in general, they will be posted here. – According to multiple sources, Mikhail Prokhorov met with Carmelo last night. Melo didn’t commit to anything at the meeting, and the Nets didn’t seem thrilled at how the meeting went. – Many sources are also reporting that Deron Williams wants to join the Knicks in 2012. With Chris Paul also a free agent, the Knicks would have to pick one of the two. It’s certainly a great problem to have. – The rumor going around is that the Nuggets want Timofey Mozgov or another draft pick. The Knicks are hesitant to add Mozgov. Shelden Williams and Renaldo Balkman would come back to the Knicks to make the trade work. – Real GM says the Knicks would get back Anthony Carter, not Williams and Balkman. – The Knicks said they have made their final offer and that it is now up to the Nuggets to pull the trigger on a deal. Smart move by Dolan and Isiah. Yeah, I just complemented Isiah Thomas and Jim Dolan. – According to Alan Hahn, Mozgov is a deal breaker for New York. He is the difference between Melo being traded to the Knicks or to the Nets. – Chris Broussard says no ultimatum has been given to the Knicks by Denver. So no Mozgov may not necessarily mean a trade to the Nets. NEW YORK (WFAN/AP) — The Knicks vs. Nets Tri-State rivalry is about to go coastal. According to the Daily News, both Knicks owner James Dolan and Nets owner Mikhail Prokhorov are set to meet with Carmelo Anthony during All-Star weekend in Los Angeles. If this is true, Melo will be a Net. I have no faith in Dolan. He’s already screwed up the Lebron meeting according to some sources. However, Jim could erase 10 years of suffering in one meeting. This should be very interesting. UPDATE: We have now learned that Dolan already met with Melo on Thursday. Knick fans, this is your only hope to land Melo.